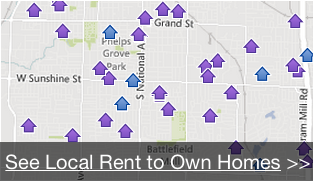 Want to see what houses we have available for rent to own in Minneapolis - St. Paul? Click here and enter your information and we’ll show you what’s available. What are the Costs of Rent to Own Housing in Minneapolis - St. Paul? Second, the costs of rent to own housing in Minneapolis - St. Paul may be higher in some areas… but for a very good reason. In some cases, rent to own rental amounts may be slightly higher versus rental rates you get elsewhere, and this is influenced by a few things — such as the neighborhood the house is in, the condition of the property, the length of the rental period before purchase, etc. Important: these vary from one rent to own seller to the next, so make sure you talk to the seller about how the costs of rent to own housing in Minneapolis - St. Paul when you’re looking to buy. Want to learn more about our rent to own program or find out what the costs for rent to own housing in Minneapolis - St. Paul are? Click here now and enter your information or call us at 952-204-7191 and we’ll be happy to walk you through our process.